Any chance that there would be a patch for those of us that would be able to load this game onto a GBA card to actually use the BCG with it? I have finished already the game with the GBSP and the gate but it's an AWESOOOOOOOOME news !!! 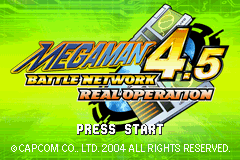 Because this game is underrated and im pretty sure, the players who will play this game will love it because this game is really fun to play with the 21 NETNAVIS! GOOD JOB ! It's my best EXE game ever! 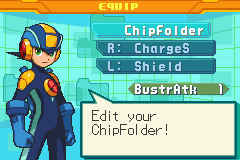 "Edit your chip folder before I choke you!. Woohoo! I really hope this gets finished. Actually, a download link is on already Trez. It's incomplete, but from my understanding, it has all the menus translated. And I actually knew about this for a while. But since it wasn't announced I couldn't talk about it. Anyway, pretty cool stuff, Prof. 9. There is a reason this game and Operation Shooting Star Rockman were not released in english-they were so terrible it was not worth the localization. Very good. 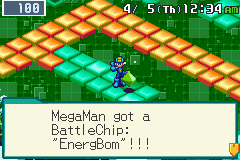 Iam not crazy about Rockman EXE series but I will collect this translation just to add to the library. Keep up the good work. Yes! Although if I remember correctly, there was a problem when playing it via computer and it had to do with the clock not advancing. Fina-friggin-ly!! I have been waiting on this forever! My god, everyone except Capcom is doing a ton of stuff for the 25th anniversary. It just goes to show. It is not the company responsible for keeping the character alive, but it's fans. Didn't people try doing a translation of this game before, like 3 times in the past? Call me pessimistic, but I'm kind of still on the "might not happen" side after seeing nearly every translation team besides the Love Plus team, starting a translation and then quietly dropping it 5 months later. Then letting everyone know it got canned, 10 months later. @Amir: Prof isn't one to easily give up though. The man while go through till the end, and has lately been the only one to make major breakthroughs in the BN hacking scene. He'll get the job done. 4.5's issues were likely another thing entirely. It encouraged the use of some external devices in normal gameplay, external devices that Capcom never saw the need to market overseas. Probably because the E-reader (anyone remember that?) bombed hard here, so anything similar would have likely followed suit. EXE 5 and 6 had the same type of thing, except it wasn't so major that both games could not make it across. In those cases, Capcom could just delete/ignore everything that had to do with the external devices in those games, as they did not have any significant impact on the core gameplay. 4.5 was also somewhat of a gaiden title (if one could even call it that), and it came out during a time in EXE franchise history where releases were jam-packed. 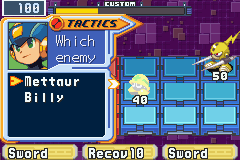 The CoA translation team was likely already in the middle of translating EXE 4 (and anyone that played EXE 4 knew how that went in terms of, er, translation quality). With EXE 4.5 and 5 coming down the pipeline... Which one was higher priority? I wish everyone good luck on this. Success would make this one hell of a milestone in Rockman community history, considering how complicated and different in structure this game is. To all people who want to play it on a classic gba/sp just buy a flash cart for 20 dollars and done. Its as if you just bought the game. I have tested it and it works beautifully.